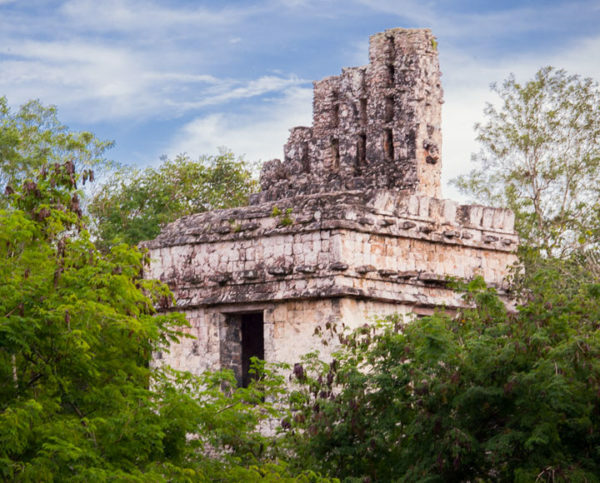 30 minutes away from the city of Campeche, to the north, hides the history of the ink that the ancient Maya used to dye their clothes, which they called ek ‘and that we know as palo de dinte. To learn how the resin was extracted, you must travel to Champotón. In this place you wil find the haciendas that, long before becoming producers of henequen thread, were suppliers of the ink, for the large number of Haematoxylum campechianum (Palo de Campeche) trees that exist in their gardens. At Hacienda San José Carpizo you can visit his wood and chapel workshop. In San Luis Carpizo, now the Marine Infantry School (Escuela Marina de Infantería), you have to walk through the halls and docks that connect to the engine room. In San Antonio del Río there is a Cenote waterhole where you can swim in pristine crystal clear waters. And in Uayamón, an old hacienda was transformed into a luxury boutique hotel that preserves the traditions of the region. Where travelers can sleep surrounded by the jungle. Uayamón’s swimming pool was installed inside the old machine room of the hacienda. You can do it on your own, however, in order you to know in depth the history and ins and outs, it is better to have the services of a guide. There are bicycle tours for 550 pesos per person, with a duration of four hours. Travelers can rent a car in the city of Campeche, since the cost of a private transportation to Isla Arena is approximately 1,200 pesos per person (one way). While the car rent 1,100 pesos for three days. Carey Ecotourism: lodging in cabins from 400 pesos per night; tour to observe flamingos: 1,900 pesos per boat (each boat holds eight people). Tel. 01 (999) 280 8513. The route is done on your own, for this you must rent a car. “Los Portales” Cenaduria is located in the city of Campeche, in the San Francisco neighborhood. The main course is the tortas de jamón clavado, a local delicacy marinated in sherry liqueur, cinnamon, pepper and, of course, clove. The place is located on Calle 10, Colonia San Francisco, downtown Campeche.